Each of the studies mentioned above provides unique insight into the degree to which cigarettes are smuggled in the United States. Each employs different measurement techniques and arrives at different results. For instance, Michael Lovenheim's paper uses Current Population Survey Tobacco Supplements data for metropolitan statistical areas in most years between 1992 and 2002, while DeCicca, Kenkel and Liu employ nationwide survey data from 2003. The first output we examined from our model involves average casual and commercial smuggling rates for 47 of the 48 contiguous states from 1990 through 2006. We estimate that on average during that period, New Jersey, Massachusetts and Rhode Island had the highest commercial smuggling import rates in the nation at 13.8 percent, 12.7 percent and 12.7 percent respectively of each state's total cigarette consumption. Note that all three states lie on the East Coast with easy access to lower-tax states such as North Carolina. Kentucky and Virginia were the only two states that we estimated had no net commercial smuggling imports from 1990 through 1996 (recall that we exclude North Carolina from the results). Indeed, we calculate that during this period, there were small net exports of commercially smuggled cigarettes from these states, though the rates were less than 1 percent of the state's total cigarette consumption in both cases. From 1990 through 2006, the states with the highest annual rates of casually smuggled imports as a percentage of their estimated total cigarette consumption were New York (9.9 percent), Washington (8.9 percent) and Michigan (6.0 percent). At the opposite end of the smuggling spectrum were casual smuggling "export" states — that is, the states whose total cigarette consumption was lower than their observed sales due to casual smugglers from other states taking cigarettes back across state lines illegally. We estimate that Delaware experienced a tax-induced casual smuggling export rate of 34.8 percent of its total cigarette consumption — the highest average annual rate in the nation during that period — followed by Virginia at 22.0 percent and New Hampshire at 21.4 percent. During this period, according to our model, only four states were destinations for smuggled cigarettes from Mexico: California (10.1 percent of the state's total consumption), Arizona (8.9 percent), New Mexico (8.2 percent) and Texas (8.1 percent). The states that may have exported cigarettes to Canada during this time period include Washington, New York, Michigan and several other Northern states, but the extent was small and not statistically significant. When we total the average figures for the 47 states contained in the model, as well as any imports and exports from Canada and Mexico, the states with the top five overall smuggling import rates are California (24.5 percent), New York (20.9 percent), Arizona (20.6 percent), Washington (20.1 percent) and Michigan (16.0 percent). The states with the highest average smuggling export rates during this period were Delaware (29.4 of the state's consumption), Virginia (20.8 percent) and New Hampshire (17.2 percent). Given the upward trend in cigarette taxes in recent years, we also estimated smuggling rates for 2006 alone. We estimate that in 2006, New Jersey, Maine and Massachusetts had the highest commercial smuggling import rates in the nation. New Jersey, which has a long history of cigarette smuggling problems, maintains a commercial smuggling import market equal to 30.1 percent of its total cigarette consumption, while the smuggling import rate for Maine is a close second at 30.0 percent. Massachusetts' estimated smuggling import rate is third at 25.4 percent of the state's total cigarette consumption. The top four commercial export states for which we have numbers during this time period (recall that North Carolina is excluded) are South Carolina, Missouri, Mississippi and Tennessee. Only South Carolina's export rate exceeded even 4 percent of the state's total consumption. In terms of international smuggling in 2006, our model suggests that Maine, Washington, New York and Michigan may have had small net smuggling exports of cigarettes to Canada, but the numbers are not statistically significant. In contrast, we estimate that cigarettes acquired in Mexico represented a large percentage of total cigarette consumption in four Southwestern states: New Mexico (18.3 percent), California (15.5 percent), Arizona (13.3 percent) and Texas (8.7 percent). In estimates of overall smuggling rates for 2006, we calculate that Rhode Island (45.7 percent), New Mexico (42.4 percent) and the state of Washington (42.3 percent) had the highest smuggling import rates as a percent of the estimated total cigarette consumption. The states of New York and New Jersey are close behind, with estimated smuggling rates exceeding 40 percent of their total cigarette consumption. Not surprisingly, given our estimates of Delaware's casual smuggling export rate, we calculated that in 2006, the state of Delaware possessed an illegal cigarette export market equal to 82.8 percent of its total cigarette consumption. We believe Delaware had a net commercial smuggling import rate of 7.2 percent in 2006, suggesting that commercial smuggling is helping feed the heavy demands placed on Delaware's cigarette market by casual smugglers from other states. New Hampshire and Virginia also appear to have been the source of significant smuggling exports of cigarettes at 37.2 percent and 28.7 percent of their states' total cigarette consumption respectively. Notes: Estimates computed based on the regression results presented in columns 3 and 4 of Table 3 of Appendix A. The sum of commercial, casual and Canada/Mexico smuggling does not equal the total presented in the final column due to the non-linear nature of the model. [*] Some municipalities, such as those in New Jersey, also levy cigarette taxes. These local taxes were not included, largely because there is no central source listing them. [†] Unlike cigarette smuggling involving Canada or Mexico, smuggling involving Indian reservations is not calculated separately in our model. Rather, smuggling from Indian reservations is included in figures for casual smuggling. 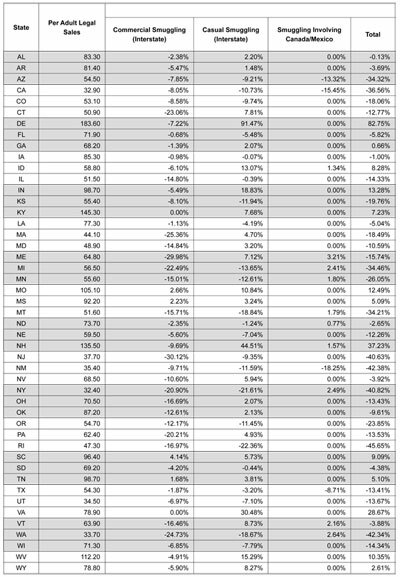 [‡] The model compares each state's cigarette tax rate to North Carolina's. Since North Carolina's tax differential with itself is automatically zero, the model would falsely imply that the state's cigarette smuggling activity was zero. In effect, the model assumes North Carolina to be the primary source of commercially smuggled cigarettes. Obviously, this assumption is not strictly correct; bootlegged cigarettes no doubt originate from other states as well. Kentucky and Virginia are sometimes mentioned as other sources of commercial smuggling. Yet there are good reasons to make North Carolina, rather than other Southern tobacco states, central to the model. Historically, North Carolina has usually had the lowest state cigarette tax in the nation. Moreover, the state is one of only two that do not require a tax stamp when cigarettes are sold in-state. The absence of this stamp makes it easier to legally purchase cigarettes in North Carolina, ship them to other states and hide their point of origin — an advantage that legally purchased cigarettes from Kentucky and Virginia, all stamped, would lack. And although South Carolina, the other state that does not require a tax stamp, now has a lower cigarette tax rate than North Carolina, this development is recent. Given that the commercial cigarette smuggling industry has a long history in North Carolina, smugglers inevitably have established sources, methods and transportation routes that make business easier for them there. Re-establishing their business in South Carolina, at least in the short term, would add to their business transaction costs. That said, a final reason for making just one state central to our smuggling model is purely technical: Assuming multiple states to be the sources would make the modeling impracticable. In effect, assuming North Carolina to be the primary source is a simplifying assumption — but as we have argued above, it is a reasonable assumption that should not be far from the truth. And in fact, the estimation results and the implications of this study are largely unchanged if Kentucky and Virginia are excluded from the sample as sources of commercially smuggled cigarettes. [§] In our model, a state's estimated total cigarette consumption is equal to the observed legal sales minus the estimated smuggling, where the estimated smuggling is positive when smugglers export cigarettes from the state and negative when smugglers import cigarettes from the state. In the first case, the state's estimated total consumption of cigarettes is lower than the state's observed legal sales because cigarettes have been smuggled out of the state after purchase; in the second case, the state's estimated total consumption of cigarettes is higher than the state's observed legal sales because cigarettes have been smuggled into the state. 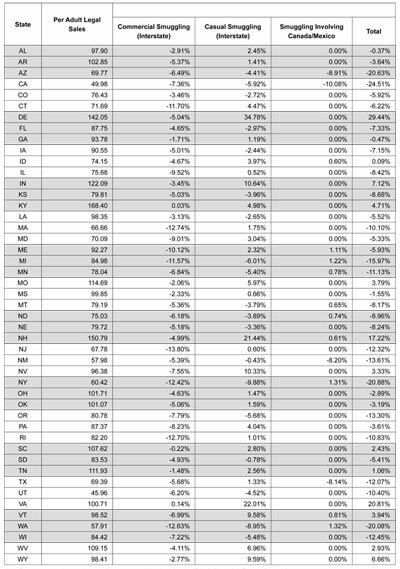 [¶] Despite the high net smuggling export rate for Delaware, the states of Maryland, New Jersey and Pennsylvania do not have large net import rates (see Graphic 7). Each of these states, however, also borders other states and regions (such as Washington, D.C.) that have high tax rates, creating some ongoing outflow of cigarettes that balances the inflow of cigarettes from Delaware. Thus, the estimated net smuggling numbers for Delaware and the states that surround it do not "cancel out" as might be expected absent consideration of other state smuggling flows.